HAMDON INDUSTRIES INCORPORATED located in Sterling Heights, Michigan specializes in vibration analysis, dynamic and static balancing, predictive maintenance programs, laser alignment and machine tool certification. 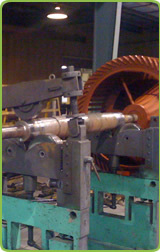 Our Predictive Maintenance Program provides regularly scheduled vibration monitoring of rotating machinery to establish trends and identify trouble spots. Prompt interpretation, analysis, and reporting of specific findings and recommendations are provided. Programs are customized to your specific requirements. Hamdon Industries provides 24 hour service in our facility or your job site. In house we have the staff and equipment to accommodate parts as small as an ounce up to 5,000 lbs, single pieces or production balancing, single plane-static or two plane dynamic. We balance fans, pulleys, electric motors, armatures, spindles, pumps, turbines, crankshafts, boring tools, cutting tools and anything else that rotates. Wherever your vibration problems are, we provide prompt, professional and courteous service, whether in Michigan or anywhere in the United States.